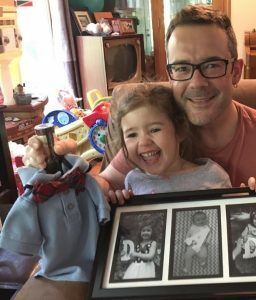 As a busy mom of three (not to mention #newbornlife), I didn’t have a ton of time to get out of the house to shop, or the mental bandwidth to come up with something creative for my husband this Father’s Day. 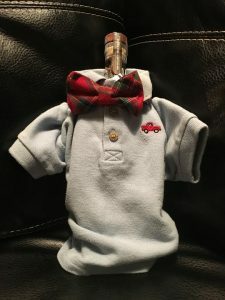 But, I do know my husband loves his bourbon, so I got him a bottle of his FAVORITE – Angel’s Envy – and dressed it up in one of Nico’s shirts and a bow tie. It looks like I actually put time and thought into it! Haha! 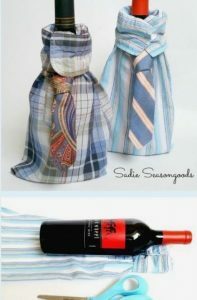 I got the idea from this Pinterest post about wrapping a bottle with a shirt sleeve and old tie (but again, #newbornlife so I didn’t have time to make anything). To help you whip up something tasty and easy this Father’s Day, here are some fun recipes that’ll please any papa’s palate. Enjoy! And Happy Father’s Day to all you fathers and father figures out there! Instructions: Combine all ingredients in a yarai. Stir thoroughly, and strain over a large cube. Garnish with an orange peel and a brandied (or Bada Bing) cherry—or a couple of extra cherries, based on Dad’s preference. Instructions: In a mixing glass, build fresh ice, Angel’s Envy, Tattersall Pommeau, green apple shrub, and bitters. Stir until well incorporated, approximately ten seconds or twenty rotations. Place approximately 1/4 parts calvados into an empty double rocks glass and swirl to coat. Add fresh ice to calvados-lined glass and strain cocktail over fresh ice. Garnish with expressed lemon peel. Instructions: Add all ingredients (except bitters) into a shaker tin. Add Ice and shake. Double strain into a double rocks glass over one large ice cube and garnish with 3 drops of Tiki bitters and a banana slice. My father is a bit of a renaissance man. While we were living in the middle of nowhere Wisconsin, he did everything imaginable in the outdoors: he hunted, trapped, fished, farmed, and learned everything he could about nature. Then he passed on as much as he could to me and my two brothers. One really cool thing he taught us was how to tap maple trees and make fresh maple syrup and maple sugar. With this cocktail, I tried to pay tribute to all of the time we spent outdoors. It’s rich, smoky, sweet and could almost be a liquid Smores—a drinkable version of what you’d make on a campfire. I think dad would approve. Instructions: Stir all ingredients into a shaker tin. Strain over a large ice cube finish with spritz of Angel’s Envy Rye, if you happen to have it.